Box in a Cloud is based on the concept of agile bathroom allowing up to 1000 inhabitants to collectively produce space capable of housing contemporary nomadic lifestyles. Its hypothetical location is in Los Angeles. A true contemporary nomadic life entails an agile bathroom. In a world of flexible spaces and mobile devices we can envision the bathroom as a participatory social network. 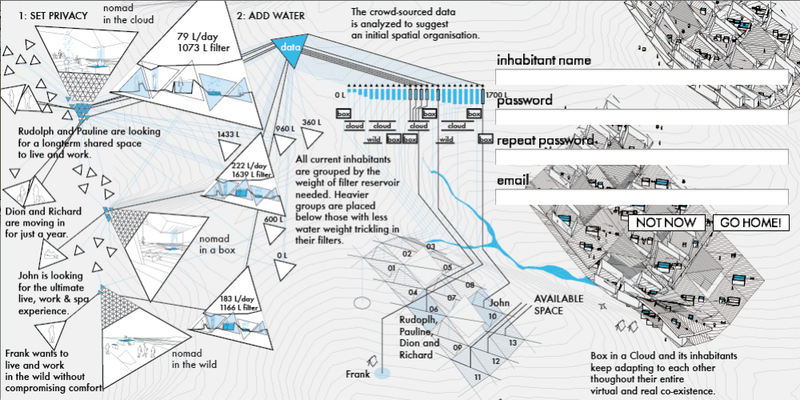 It creates a dynamic landscape that harvests, filters and provides the delightful experience of water. As the inhabitants change, this agile landscape of water adapts. 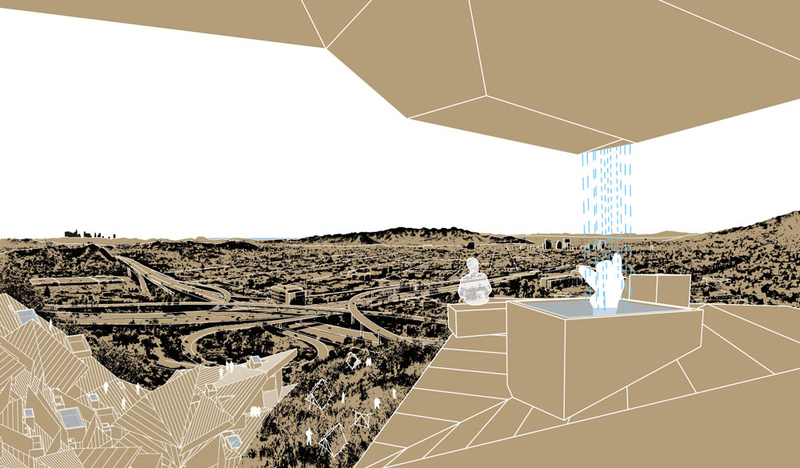 The bathroom is an architectural device that moves water to clean the body. 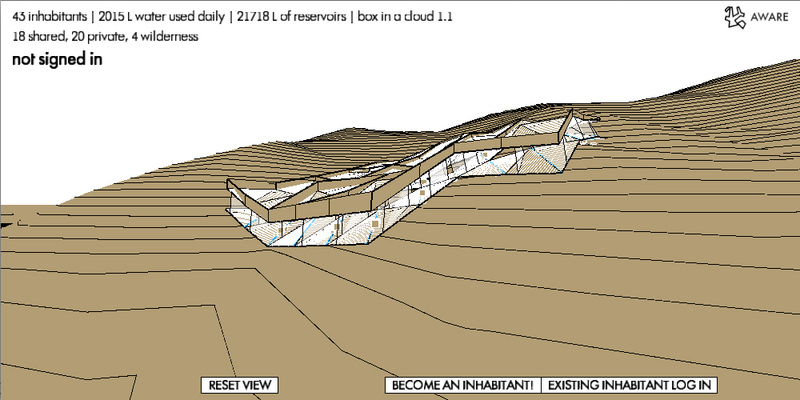 In Box in a Cloud, every time water is moved it creates a spatial feature that can be experienced by the inhabitant. 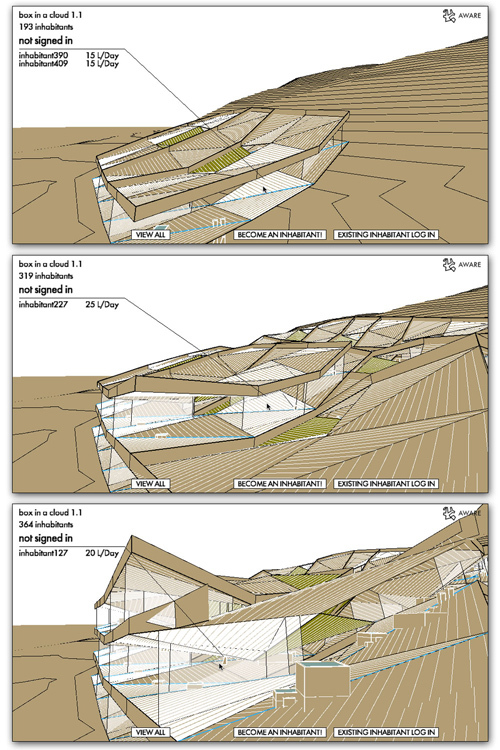 The water flows sideways in the folds, downwards as waterfalls and upwards within the walkable surfaces. Rooted in California’s spirit of soft relationship between inside and outside, the project draws references from the landscaped yard of Schindler House and the outdoors bathroom and folded canopy of Lautner’s Sheats Goldstein Residence. Flowing water changes the landscape. Architecture is a change in the landscape. A reversible composite material makes Box in a Cloud. Consisting of fabric sheet, fibers and hardening matrix, it can be laid into any form by human or machinic labour. The degradable eco-friendly matrix varies from soft to hard. It dissolves with time or with the introduction of a solvent, making reshaping possible. The fibrous reinforcement defines the texture and transparency of the surfaces and is reusable from cycle to cycle. A cycle’s length is linked to the change of inhabitants or their needs and could be a year or a season. Box in a Cloud 1.0 was shown at the Final Projects XXXV Exhibition at the Mackey Apartments at MAK Center, Los Angeles. 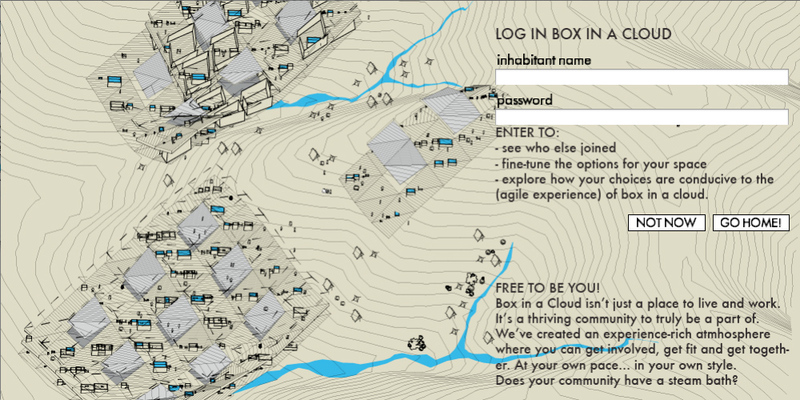 A computer terminal allowed visitors to be the first to sign-in into Box in a Cloud. Through a live perspectival projection guests could follow as the “cloud” grew and developed. 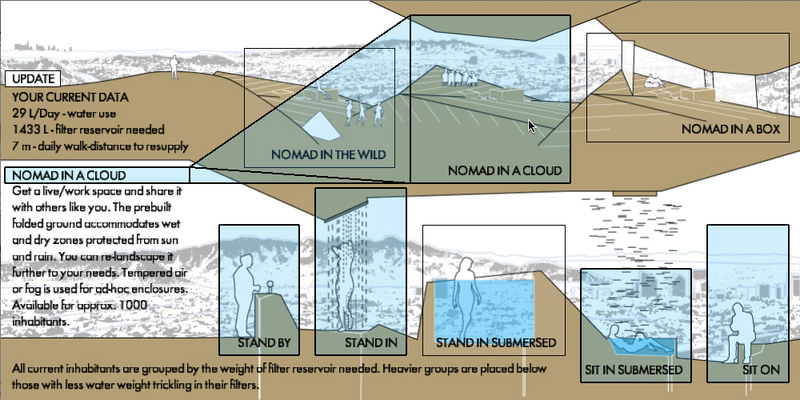 Visitors could take out a printed fold-out leaflet explaining the concept, showing speculative drawings and instructions on how to take part in Box in a Cloud. 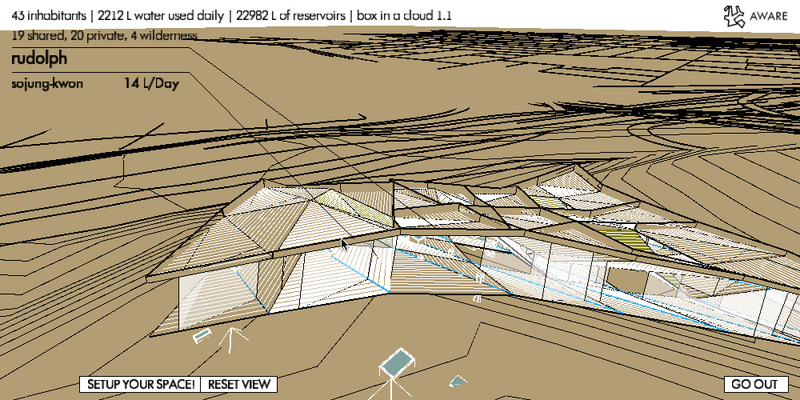 Box in a Cloud was initiated by Anton Savov during his residency at MAK Center LA from 1 October 2012 to 15 March 2013. 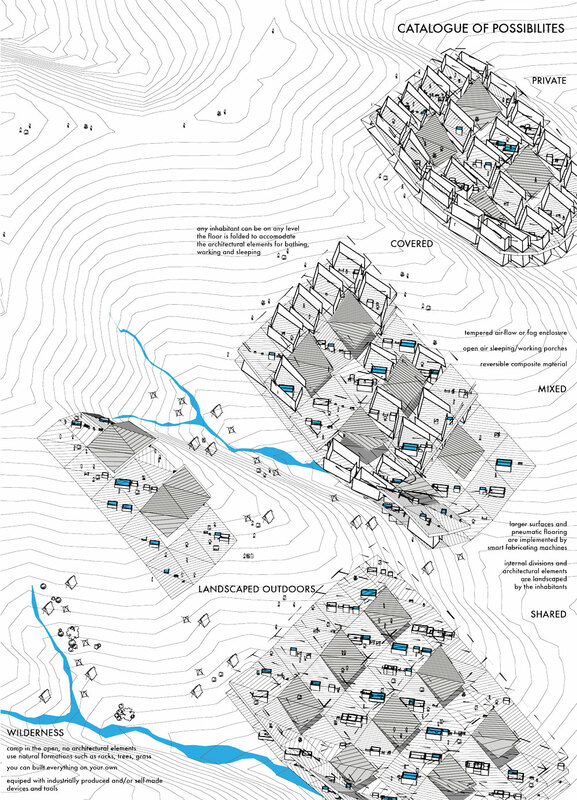 The Residency of MAK Center for Art and Architecture is a programme of MAK Vienna and MAK Center LA.